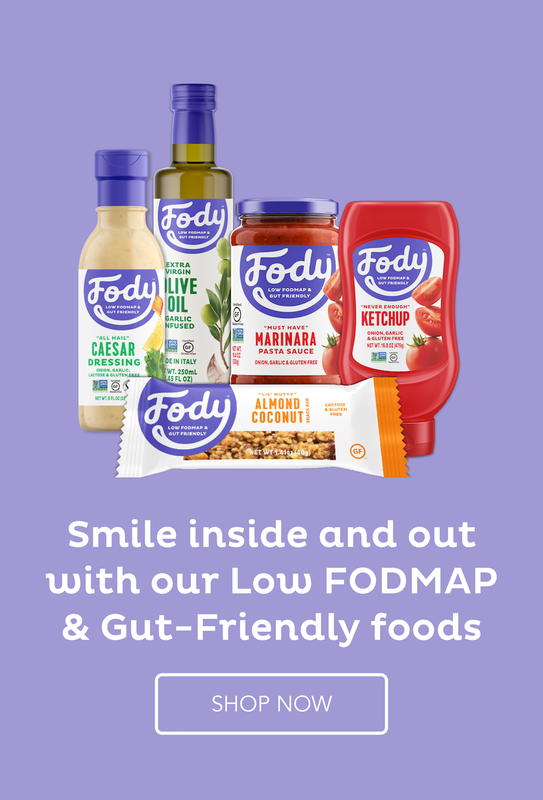 People on the low Fodmap diet for irritable bowel syndrome often complain about the lack of flavour in our food, though I completely disagree with that. Most herbs and spices are permitted and they are what usually flavour our food, but in today’s video, I want to address the role of garlic-infused oil in our diet. It comes with a warning. We all know that garlic and onions are a problem for those of us with irritable bowel syndrome. They contain fructans and these fructans in garlic and onion are not absorbed by anybody in the population. But they don’t feel the symptoms the way we do with our sensitive guts so we have to avoid them. But so many cuisines today are based on onion and garlic from Indian, to Italian, to Mexican. They all seem to have it. Asian foods – Thai foods, Vietnamese foods are all based on, at least, garlic. So, if we want that flavor, we turn to infused oils because the fructans in garlic and onion are not soluble in oil. Whereas, they do dissolve into other liquids. So, we can have a garlic-infused oil where the garlic has been completely removed from the oil, and it will give us the flavor without the fructans. The problem is that they’re quite expensive to buy, these oils. So people think that they will make them themselves and that’s fraught with danger because the conditions in which you make these infused oils at home are perfect conditions of low oxygen, low acid, and warm temperatures for you to get botulism. Botulism is a potentially fatal illness, very unpleasant. You do not want to get this. You do not want to risk it. If you make an infused oil, use it immediately or at least within a few hours because already the bacteria are starting to grow. The other thing you can do is put them in the refrigerator. But, again, don’t keep it there very long. Within a week you would have to use it because even in there bacteria are growing. But it doesn’t at least have the warm temperatures which makes it thrive. So, the safest thing is to either make it fresh and use it immediately, or buy it commercially because when they prepare it commercially, they make sure that no water or food particles get in there to create a problem with bacteria, and that it is safe to be using that. You don’t have to keep it in the fridge either. So, just in case you thought that was a shortcut, sorry, it’s not a very clever one. Use it fresh or use a commercial oil. Thank you for watching and goodbye. I have been making garlic infused olive oil. I let it cool in the pan & then I put it in mini silicon ice cube trays and freeze it. After it’s frozen the little cubes pop out easily & I put them in a plastic freezer bag. They are about a 1/2 tablespoon in size. I haven’t had any problems with this. Have you tried it? That sounds like a good idea. Many oils don’t actually freeze. How well does your oil freeze?